Basil's Blog: How did this happen? It's not fresh news, but it's still shocking and surprising to me. 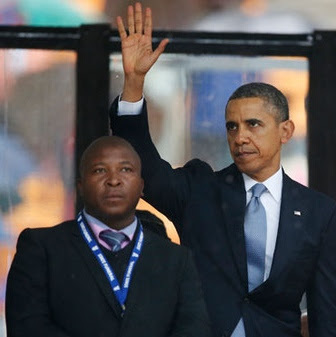 In Johannesburg last week, there the fake stood, on TV for the whole world to see. It was the funeral of Nelson Mandela, and one by one, dignitaries came to the podium and spoke. But it soon became apparent that something was wrong. The picture above shows the problem. There is the fake, standing there for the cameras. He knew he was begin watched. He must have known that people would eventually realize that he wasn't capable of doing the job he was picked to do. He had no qualifications, and, based on statements that have come to light, is a serial liar. Today, people realize he's a fake, and has even been the subject of derision on Saturday Night Live recently. But, even after everything I've read and heard, I still don't understand how it came to happen. How, oh how, did Barack Obama ever get elected? That picture is worth one word: GOBBLEDEGOOK. To Jimmy's Avatar: "It's a snaaaaaake!" If I like your vote, you can keep your vote. Fake voters, fake citizenship, fake qualifications. What else is new? How many fingers am I holding up Winston?